This is the 34th in a series of posts on the Fujifilm GFX-50S. The series starts here. In the previous post, I found some anomalous behavior with the Fujifilm GFX 50S autofocusing with the 120 mm f/4 native macro lens at f/5.6. There have been Internet discussions that say that there’s something strange about the GFX manual focus, too. I decided to do the same kind of test that I did in the previous post (only with a lot fewer images) to see what happened at f/5.6, and to look for odd behavior. First off, let’s talk about the GFX manual focusing. There are three magnifications available in addition to full screen, selectable via a thumbwheel that is part of the default control to turn magnified view off and on. As far as I’m concerned, only the most magnified view is useful for critical focusing, and I’d really like more magnification than that. In addition, focus peaking is available, in two levels and three colors. The lowest level is very useful in the field. The highest level just lights up the screen all the time. In fact, for sharp lenses, high-contrast subjects, and good light, the lowest level is often too sensitive. Peaking in the GFX, as in most cameras, is mostly useful in conjunction with magnified view. Full frame peaking is too much of a blunt instrument to be of much use except for DOF assessment. 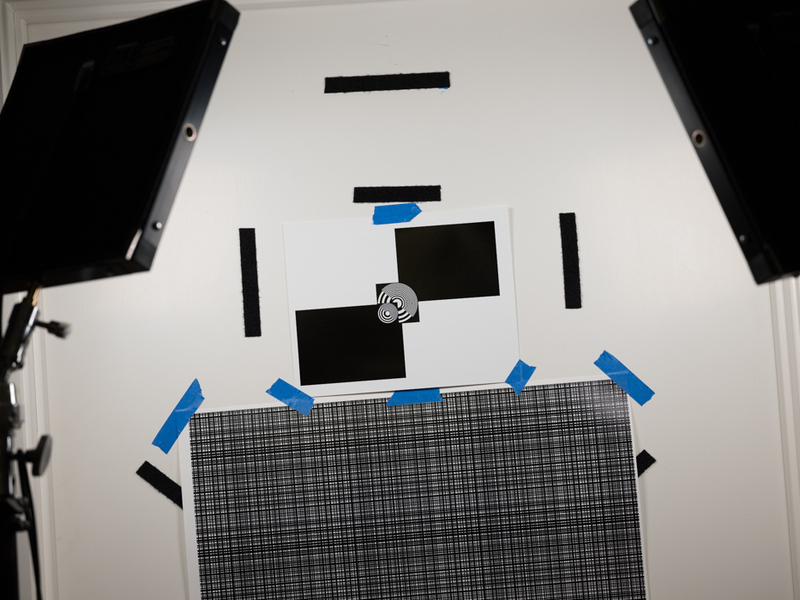 Rather than tilt the target to get the slanted edge to the right orientation, I just cranked a little roll into the camera. The zone ploate turned out to be too high contrast for best focusing, but I used it anyway. I set the peaking to low, and the color to red. I focused at the taking aperture. I have programmed the button on the front of the GFX where the DOF preview is on an SLR to act kind of like that button. Press it once to stop down, and again to open up. There is a little picture of an iris diaphragm that appears in the finder when the lens is stopped down (but not in magnified view) so you don’t get confused as to whether the lens is open or stopped down. At each whole aperture from f/4 through f/11, I focused and made three exposures, then did that again. I developed the iamges in Lightroom with default settings except for white balance. Lighting was the same as in the two immediately previous posts. I’ll give particulars about the setup at the end of this one. As an aside, it’s a lot easier to focus this lens if you turn on the OSS function. I forgot to turn it off before making the exposures once, and it didn’t seem to hurt the results, but I haven’t included that data here. Here are the average of the six exposures at each stop, and the better of the average of the three exposures at each stop that were the sharpest. There is not a lot of difference between the average and the best shot at each aperture. Probably I should have done more shots each time I focused, but this is definitely a an experimenter that is hard on the experimenter. If I’d had a lower-contrast target, it would have been a lot easier. How’d I do against the auto focus? Whenever I do this comparison with cameras that either focus using contrast detection or tweak the focus that way, it’s usually a humbling experience. In this case, the autofocus bested me quite convincingly wide open, but I trounced it at f/5.6. Let’s call f/8 and f/11 a draw. So there’s definitely something strange about the GFX autofocus with this lens at f/5.6. And it appears that there’s no weirdness in the manual focusing of the GFX, at least with this lens. Shutter set to A mode. Until Fuji fixes the f/5.6 issue, the take home lesson for critically focusing this lens is: if you must use f/5.6, focus manually. 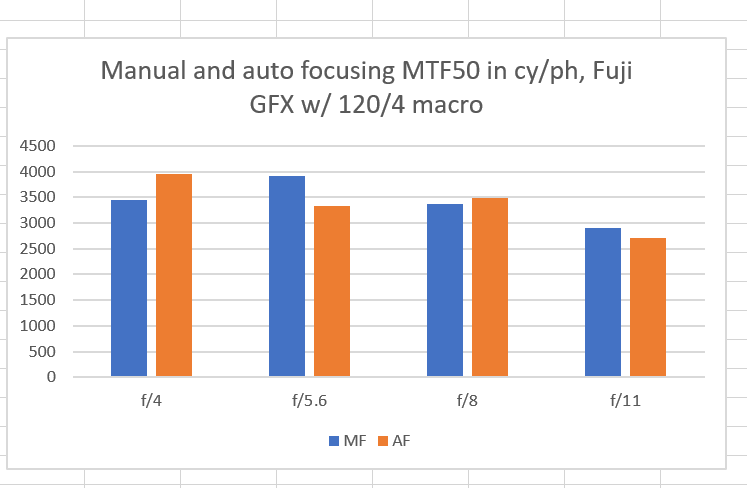 Note that in many, and probably the vast preponderance, of photographic situations where you’d want to use AF, the small loss in sharpness of the Fuji AF system would go completely unnoticed. Thank you for all the work you are doing. Hopefully it leads to Fuji taking action on the problem. 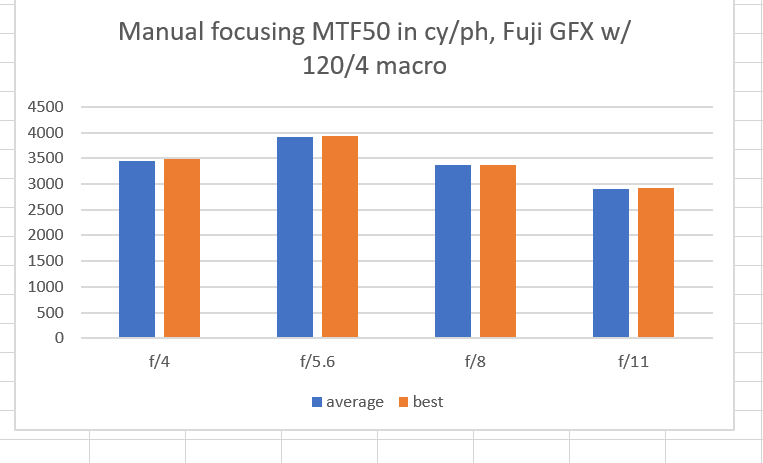 Despite Didlloyd concerns about manual focus, your results suggest that manual focus is in fact reliable, given your use of low level peaking combined with the highest magnification focusing. It would be nice if Fuji would arrange that focus peaking only applies to the magnified view and not the regular. But here manual focus has been made in some kind of stop down mode.I mean the focus has done in the desired shooting aperture.Diglloyd didn’t do that.